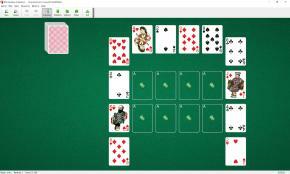 King Solomon's Cave Solitaire uses 104 cards (2 decks). 12 tableau piles are placed on the board in the form of a frame (4 cards on each of 3 sides). At the start of the game 3 cards are dealt face up on each pile. In the center of the frame there is space for 8 foundations that are built up from Ace to King in suit. You can place one card in frame on top of another (as squared pile) in suit in reverse order. When one of tableaus is empty it immediately fills up with 3 cards from the waste or from the stock pile if possible, then by any card. When you have made all the moves initially available, begin turning over cards from the stock pile. 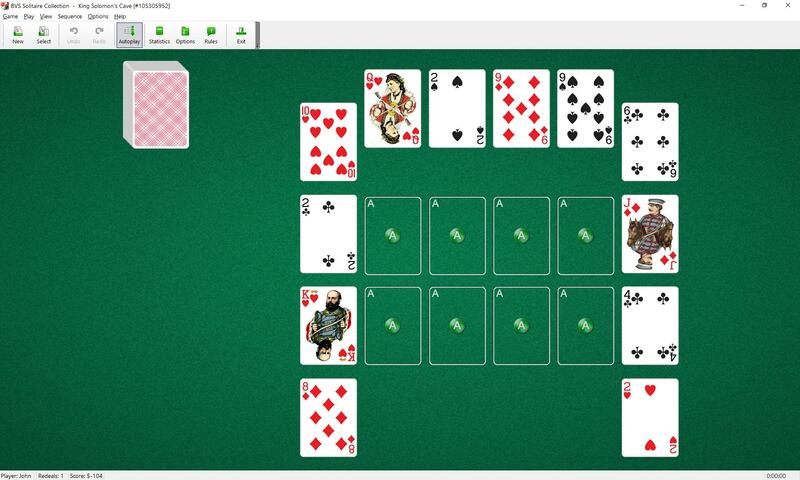 You can move cards from the stock pile to the tableaus and to the foundations according to the rules above. When the stock is empty, click on it to pick up and redeal the tableau piles.